Scallops are one of my favourite seafood dishes. It is a pity that they are so rarely found on restaurant menus as the sweet succulent meat is delicious and doesn’t require a lot of effort to make something special. I’m not a big fan of surf and turf but in this case the pancetta really compliments the flavour of the scallop meat. Pancetta is air dried pork belly and is rubbed with herbs and spices to give it lots of flavour. It also has streaks of fat which prevent the scallops from drying out. Wrap each scallop in a piece of pancetta and set aside. Bring a pot of salted water to the boil and add the beans. If you have a steamer place it on top of the beans and steam the asparagus. The beans will be ready in 5 minutes and so will the asparagus. Put the butter in a frying pan and heat up until the butter stops foaming. Fry the scallops for 3 – 4 minutes just until the pancetta starts to crisp. 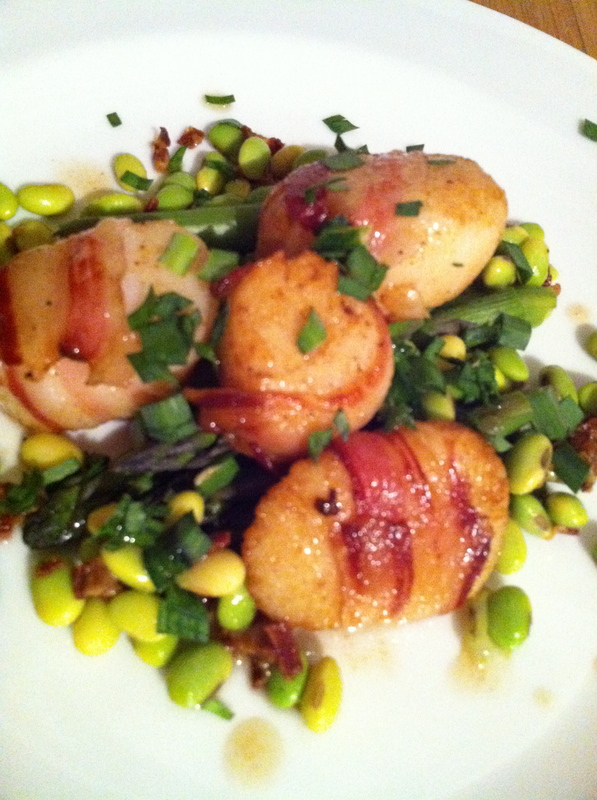 Arrange the asparagus and edamame on a plate and top with the scallops. Add the lemon juice to the pan to deglaze and pour the sauce over the scallops. Sprinkle with chopped chives and a little freshly ground black pepper. You don’t need to add salt to this dish as the pancetta will provide this. Serve with a nice hunk of Knead ciabatta and you have the perfect dish for a light lunch or halve the portion for an elegant starter.